For the perfect balance between style and function, this Custom Phone Case offers a streamlined appearance with a hard plastic back combined with a durable TPU bumper for added grip and protection. This makes a great gift for events, trade shows, employees, friends, and family. Available now for the iPhone 8 and 8 Plus, and pricing includes matching custom packaging! Compatible with all versions of iPhone 8, 7 and 6. Works with wireless charging on iPhone 8 as well. Wholesale pricing is available for businesses and resellers. Our industrial print process creates hundreds of cases in one pass, making large orders affordable. 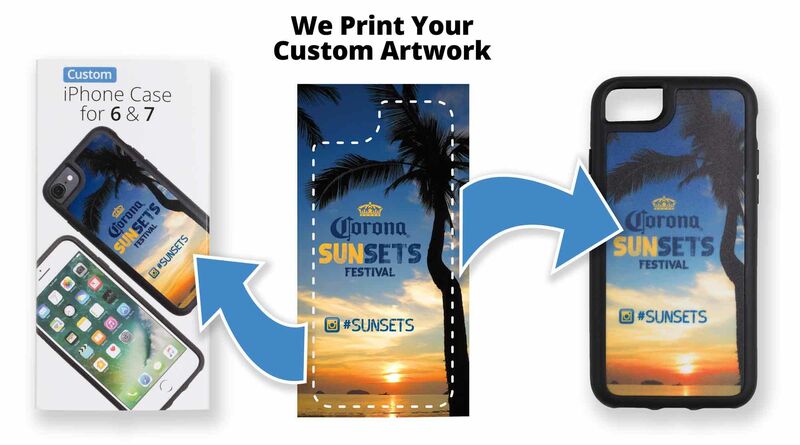 The Custom Phone Case is great for businesses to show off their logo, or also for a corporate giveaway. Premium quality custom iPhone case in matching custom package, available in bulk quantities at an affordable price. This slim profile phone case provides protection using a rigid polycarbonate back and soft TPU bumper all around. Our high-definition printing with vibrant full-color artwork projects a premium image for your brand.